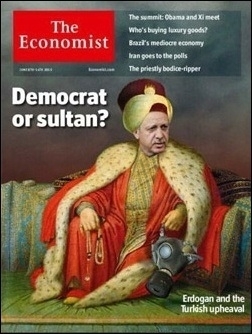 A rhetorical question by the time the Economist ran this cover of Turkish President Recep Tayyip Erdogan in June 2013. Why would a prime minister, who only a few months ago won a general election with 49.5% of the vote, step down? Corruption allegations? A soaring opposition? Plummeting public approval for this or that reason? A scandalous affair that fell into the public domain? None of those applies to Turkey's prime minister, Ahmet Davutoglu, who on May 5 announced that he would take the ruling Justice and Development Party (AKP) to an extraordinary general convention, where he would not run for chairman or prime minister. After barely 20 months in office, Davutoglu was abruptly quitting. At the press conference where he announced his decision to stand down, Davutoglu said this was "not my choice but a necessity." He then blamed the AKP's central executive committee for not having exhibited the "comradeship" he would expect of them. But why were the committee's 50 members so mean to a super-popular (and successful, in his account) leader? Simply because he was not a leader, but just a grand vizier appointed 20 months ago by the sultan who goes by the title President of Turkey, Recep Tayyip Erdogan. Indeed, Davutoglu's resignation was a "necessity," not his choice. It was a necessity because the sultan wanted a lower-profile, more obedient grand vizier, who would work in line with the sultan's priorities, and not his own. No doubt, Davutoglu has been loyal to Erdogan. Even as he announced his resignation he pledged full fidelity to the president and the party. And he meant it. So, what was the problem? Simple: Erdogan wanted a sultan-grand vizier partnership, whereas Davutoglu mistakenly thought that the two Islamist comrades were the president and prime minister. 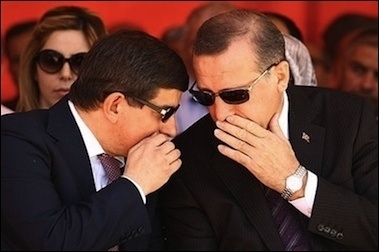 Turkish Prime Minister Ahmet Davutoglu (left) fancied himself an equal partner of Erdogan (right). Davutoglu, who became prime minister in August 2014 after Erdogan was elected president and had handpicked him to take the job under his dark shadow, thought that he really was the prime minister. Bidding farewell, he lamented that: "We agreed [with Erdogan in 2014] that the country needed a prime minister, not a caretaker prime minister." Twenty months later, the Turkish Putin-Medvedev system collapsed, primarily because the Turkish Medvedev mistakenly thought that he was free to run the executive as the Turkish constitution dictates but was in fact expected to be a pawn -- fully, not partly, controlled by the Turkish Putin. At an extraordinary party congress on May 22, the AKP will elect its new "leader" who will automatically become the new Turkish prime minister. There will not be a race among several contenders. Instead, there will only be one nominee, the sultan's new choice for the grand vizier. There are a number of hopefuls, including Deputy Prime Minister Numan Kurtulmus, Justice Minister Bekir Bozdag, Transport, Maritime and Communications Minister Binali Yildirim and Energy Minister Berat Albayrak, Erdogan's son-in-law. Naturally, everyone is curious about the new head of the Turkish executive. In reality, it matters little which of the hopefuls will take up the job. Erdogan could just well choose a computer, or an advanced office machine to appoint as the new prime minister, instead of a person, had technology allowed him to do so. Whoever takes the job he will be a rubber-stamp prime minister working as the sultan's appointed party commissar. As one senior AKP official said: "The new prime minister should be a low-profile figure." The office of the Turkish prime minister will henceforth be a secretariat of the presidential palace. Can anyone instantly tell the name of the Chinese prime minister? Well, his Turkish counterpart may be a bit better-known to the rest of the world, but much more than a ruling party secretary general controlled by the president who, according to the constitution, does not have authority over the executive, legislative and judicial branches of the state. The office of the prime minister, from now on, will be a secretariat of the president's palace, whoever gets the job. As Dexter Filkins reminded us in the New Yorker: "It's an old story: the loyal satrap, who makes a career for himself by faithfully snarling at his master's critics, finally gets thrown overboard himself." When Erdogan came to power in 2002, his most trusted political allies were Fethullah Gulen, a U.S.-based Muslim cleric running a (now ailing) global network of schools, enterprises, NGOs and charities; Abdullah Gul, Erdogan's predecessor as president; and Bulent Arinc, former parliamentary speaker and deputy prime minister. In 2009, Davutoglu joined the court of the sultan's most favored men. Today, Erdogan is fighting to jail Gulen, with an extradition warrant on his head; Gul and Arinc have already been sent into the political wasteland; and Davutoglu has been the last victim of "comradeship." The next sultan's favorite will surely try to behave better. But he may not survive too long -- only until the sultan decides to choose another.